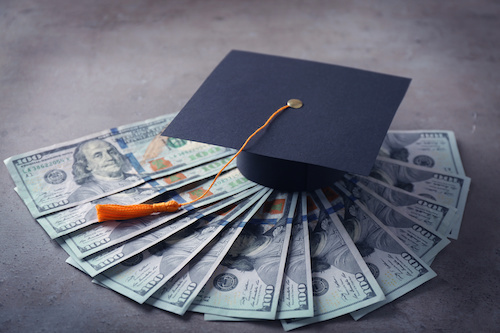 Recently, several states have adopted policies that ostensibly make college education free to their residents, but with strings attached to this benefit. The most famous program is undoubtedly New York’s. Under the “Excelsior Scholarships” plan recently signed into law by Governor Andrew Cuomo, state residents who come from families with annual incomes under $125,000 won’t have to pay tuition if they enroll at a college or university in the state’s system. The catch is that after they graduate, students who availed themselves of the government’s “generosity” are obligated to live and work in New York for the same number of years as they received free education. A student who earned her B.A. degree from, say, SUNY-Binghamton in four years would have to stay and work in the state for four years afterwards. If she should decide to take a job in another state, then her free tuition amount is converted into a loan from the government she would have to repay just like any other student loan. New York and Connecticut are both controlled by Democrats. But we are also seeing “strings-attached” higher education policies in some Republican states. As in New York, however, the education is free only if the student stays and works in Arkansas for three years. Leave for another state and the state’s subsidies turn into a loan and the benefits are clawed back. Similarly in Kentucky, under the Work Ready Scholarship Program, students can enroll for free in certificate programs at community colleges and four-year universities—but only if they pursue certain fields of study deemed to be in high demand. The reason for the program was provided by Hal Heiner, secretary of Governor Matt Bevin’s Education and Workforce Cabinet: “We want to get people on the first or second rung of the employment ladders, where there are a lot of open jobs.” In Kentucky, however, there is no requirement that students who avail themselves of these free programs must remain within the state or pay their tuition back. At first glance, these state programs perhaps seem sensible. What’s wrong with having the state “invest” in the education of its people, but then recoup that investment if a student decides to work in another state? And why not encourage people to choose those educational programs that seem most likely to lead to good jobs? Aren’t the citizens of New York, Connecticut, Arkansas, and Kentucky going to be better off? No, they aren’t. The reason why is that the markets for education and labor work pretty efficiently. Programs to steer students into presumably high-value education and to keep residents who have taken advantage of “free” college within the state don’t produce any net benefits. The implicit assumption behind this policy is that the state loses unless the students it “invested in” stay put so the government will recoup its outlays. That assumption is mistaken. Our nationally (even internationally) competitive labor market will put competent workers in jobs without regard to where they happened to do their studies. The workers hired will then pay taxes to the state whether or not they had their education and training subsidized by that state, some other state, or by no state at all. Let us say that Susan qualifies for an Excelsior Scholarship and earns her B.A. in accounting from SUNY-Stony Brook. She now looks for work, bearing in mind that if she takes a job outside of New York, she will pay a heavy cost since all that education the state gave her turns immediately into a debt obligation if she goes to another state. Therefore, she (like many other state graduates) confines her search to firms in New York. Is that good? No. Susan may miss out on a better job fit elsewhere, and the firm that hires her might very well have hired an applicant who studied in another state instead. As far as the state treasury is concerned, the same amount of taxes will be collected. New York’s fiddling with the interstate labor market does nothing to create more jobs, wealth creation, or tax revenue within its borders. State policies that subsidize higher education but then attempt to keep the beneficiaries from leaving are first cousins to the sort of tampering with interstate commerce that the Constitution prohibits. They might not be ruled unconstitutional if challenged, but are nevertheless harmful. How about the other kind of state policy under discussion, namely free college but only for certain kinds of programs that political leaders have decided merit enhanced subsidy? Governors Hutchinson and Bevin proclaim that this approach will give their states the workforce needed for optimal business and economic development. They’re mistaken. Just as the market for labor distributes people to the jobs they are best suited to (without regard for political boundaries), the market for education works to draw people into the kinds of study and training they are best suited to. Making certain programs free won’t improve that market, but it will have bad, unintended consequences. For one thing, most people are smart enough to figure out where job opportunities are strongest and which postsecondary programs provide them with the best avenues into those fields. There is no need to give away education that people would have willingly paid for (and perhaps valued more highly and taken more seriously if they had). And drawing students into programs provided by government-run institutions with free education gives those schools an undeserved advantage over competing programs offered by non-government schools or firms. Cooper is right. Business should bear the cost of worker training and will do it more efficiently than the government will with its clumsy free college approach. Politicians like to build popularity by claiming that they are using government power to make life better, but their plans almost always work less well than expected and have a host of unintended costs and repercussions. That is just as true for higher education as for everything else. Strings-attached policies may sound good but really make no sense.